« 36. Passover – Atonement on the 9th? How about we take a look at the events as given by John 18:19-19:22. The high priest then questioned Yahushua about his disciples and his teaching. Yahushua answered him, “I have spoken openly to the world; I have always taught in synagogues and in the temple, where all Jews come together; I have said nothing secretly. Then they led Yahushua from the house of Caiaphas to the praetorium. It was early. They themselves did not enter the praetorium, so that they might not be defiled, but might eat the Passover (Pharisaic practice on Abib 15). This was to fulfill the word which Yahushua had spoken to show by what death he was to die. I find no crime in him. Then Pilate took Yahushua and scourged him. And the soldiers plaited a crown of thorns, and put it on his head, and arrayed him in a purple robe. See, I am bringing him out to you, that you may know that I find no crime in him. Take him yourselves and crucify him, for I find no crime in him. When Pilate heard these words, he was the more afraid. But Yahushua gave no answer. When Pilate heard these words, he brought Yahushua out and sat down on the judgment seat at a place called The Pavement, and in Hebrew, Gabbatha. So they took Yahushua, and he went out, bearing his own cross, to the place called the place of a skull, which is called in Hebrew Golgotha. There they crucified him, and with him two others, one on either side, and Yahushua between them. 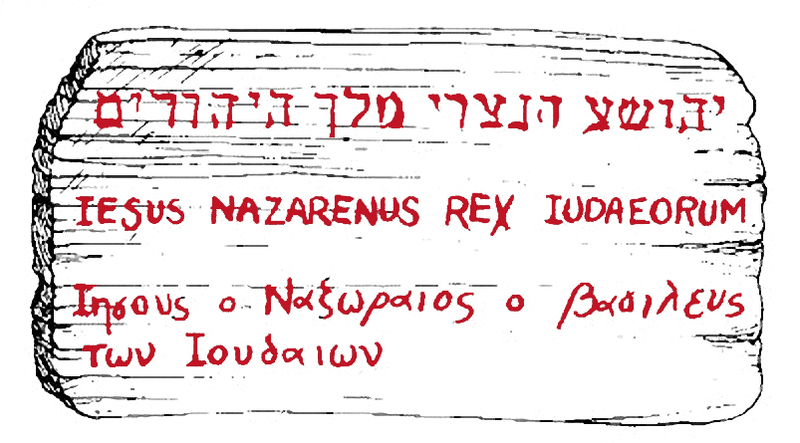 Yahushua of Nazareth, the King of the Jews. Many of the Jews read this title, for the place where Yahushua was crucified was near the city; and it was written in Hebrew, in Latin, and in Greek. What I have written I have written. Time to slow down everyone and think about it! Pilate knew that he was coerced by the Jewish religious leaders to have the Roman state perform the execution of an innocent man. Under normal circumstances, Pilate would have cared less about a seemingly routine crucifixion of a Jewish criminal. No doubt, according to the text, Pilate sensed that he was dealing with no ordinary man. Pilate recognized Yahushua’s innocence and wished to release him but eventually succumbed to the pressure by the Jews for a Roman sanctioned execution. When Pontius Pilate was pressed upon further by the Jews to alter the inscription that he had written, thereby maintaining the fraud perpetrated upon Yahushua, he would have none of it! Whether he knew it or not, Pontius Pilate actually inscribed the answer to the question that he had previously posed to Yahushua and then had it placed at the execution site for all to see. Ironically, the Jewish religious leaders were to be confronted with the truth of who it was that they had convicted of blasphemy according to their law and who they wrongfully condemned to death. This entry was posted on 02/09/2014, 8:16 am and is filed under Crucifixion, Easter, Jews, Messiah, New Testament, Passover, Religion, Unleavened Bread, Yahushua, Yahweh. You can follow any responses to this entry through RSS 2.0. You can leave a response, or trackback from your own site. I truly appreciate your efforts and dedication in offering us an avenue to explore as we search for the truth. Your manner and method of explaining a subject and exposing a new concept is acceptable to a beginner like me.